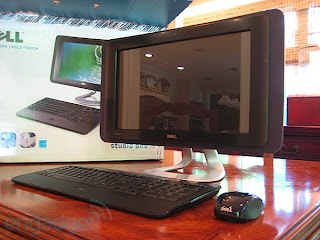 Just saw this new PC up on Engadget (where I got the pic, hope they don't mind). Dell have released their Studio One 19 and thankfully are moving away their ugly boxes hidden under desks or stacks of papers. The new PC looks nice and modern and sure why wouldn't it considering it looks like an iPhone. Seriously look at it. All PC companies can learn lots from Apple designs but making a PC sized iPhone? Hmm, don't know about that one. I imagine we will see lots of these in office receptions and customer meeting areas but I can't see myself handing over my own money for one.